A mother hen tells her chicks about the egg that wanted to fly. -The egg was young. It didn't know much. We tried to tell it, but of course it didn't listen.- The egg loves looking up at the birds (yes, it has eyes). It climbs 303 steps (yes, it has legs) to the top of a very tall tower--and jumps. It feels an enormous egg rush. -Whee - it cries. -I am flying - But it is not flying, it is falling. Hold your tears, dear reader--there is a sunny ending for this modern-day Humpty Dumpty. 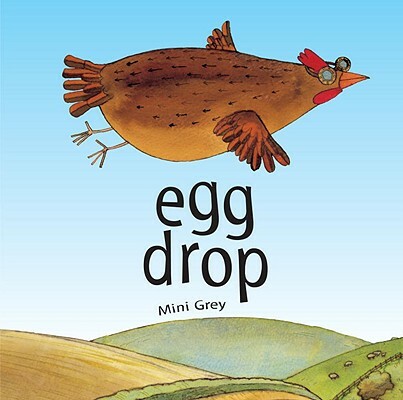 Impossible to categorize, Egg Drop is Mini Grey at her zaniest. Mini Grey is the brilliant young author-artist of Traction Man Is Here!, which won the Boston Globe-Horn Book Award; its sequel, Traction Man Meets TurboDog, which was the recipient of many starred reviews; and The Adventures of the Dish and the Spoon, a Kate Greenaway Medal winner. "Kids in general will roar with laughter at this expectation-busting tale."